ImmunoPrecise to Lead Scientific Round-table Discussion and Poster Session at hubXchange’s European Antibody Therapeutics event. At hubXchange’s European Antibody Therapeutics event, held in Munich on March 21st, Dr. Debby Kruijsen will lead a round-table discussion entitled “Implementing discovery strategies to value the therapeutic potential of lead antibody candidates” while Nienke Smits will present a poster entitled “DeepDisplay™: a powerful and unique human lead antibody discovery platform utilizing OmniMouse®”. While attending this event, the ImmunoPrecise team will also be participating in one-on-one meetings with current and potential clients. Contact us today to learn more about how we may help with your antibody discovery and protein engineering needs to accelerate your therapeutic pipeline. ImmunoPrecise will be exhibiting at the Americas Antibody Congress 2019 at Festival of Biologics, a multi-streamed, co-located conference & technology exhibition March 4 – 5, 2019 at the Grand Hyatt, in San Diego, California. Attending from ImmunoPrecise will be Dr. Jennifer Bath and Kari Graber. Stop by booth #11 to learn more about how we may help with your antibody discovery and protein engineering needs to accelerate your therapeutic pipeline. 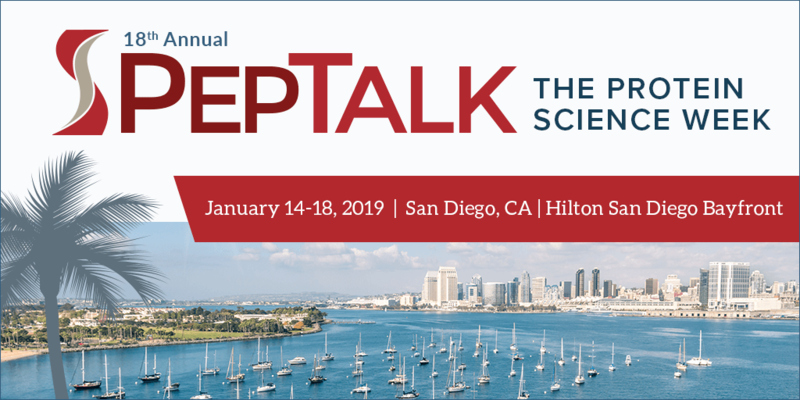 ImmunoPrecise will be attending PepTalk 2019, the Protein Science Week, from January 14-18th, 2019. PepTalk is the largest annual gathering of protein science researchers in the world. The conference focuses on intensive learning to discover new opportunities, apply alternative solutions and develop promising partnerships through keynote speakers, seminars and short courses. Attending from ImmunoPrecise will be Dr. Deanna Dryhurst and Fiona Zhang-Ruane. Schedule a meeting and stop by booth #700 to learn more about how we may help with your antibody discovery and protein engineering needs to accelerate your therapeutic pipeline. ImmunoPrecise, ModiQuest Research, and U-Protein Express will be attending the 10th annual PEGS Summit Europe. 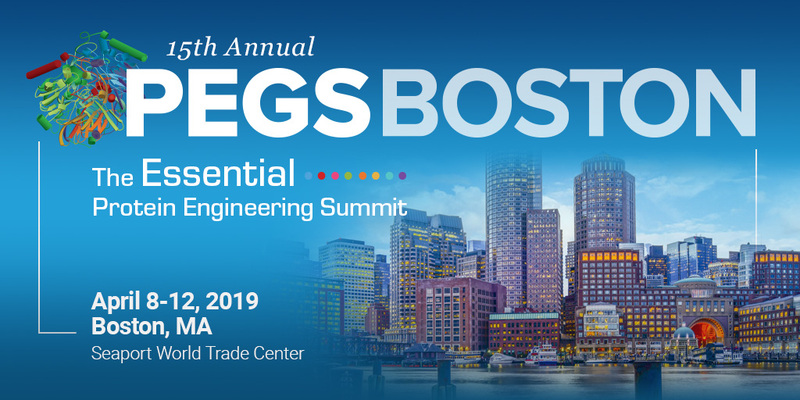 PEGS (Protein & Antibody Engineering Summit) is the largest European event for all aspects of protein and antibody engineering, offering keynote speakers, seminars, dedicated networking, and short courses. Meet with our team at booth #615 to learn more about our full service cycle of therapeutic antibody discovery. Dr. Jos Raats, Dr. Roland Romijn, and Nienke Smits and will be attending from ModiQuest Research and U-Protein Express. Contact us to set up a meeting. Interested in meeting attendees with similar interests and goals? Check out PEGS Europe’s new 1-on-1 networking system. ImmunoPrecise is excited to announce that we will be a part of the European Antibody Congress within the Festival of Biologics in Basel, Switzerland from October 29th to 31st. The European Antibody Congress is a multi-streamed conference and technology exhibition that brings together over 1000 attendees, including representatives from big pharma, biotechs, academia and technology innovators. Offering opportunities for networking with industry peers, conference segments featuring enlightening talks from industry leaders, and an exhibition showcasing the latest technical innovations in the field, the event is the perfect place to feel connected and inspired. ImmunoPrecise’s CSO, Dr. Deanna Dryhurst will be in attendance, along with ModiQuest’s Head of Contract Research, Dr. Debby Kruijsen who will also be a feature speaker in the on-floor seminar’s Drug Discovery Technology panel discussion. The panel will address modern therapeutics antibody drug discovery technologies and how our platforms can face the challenges of drug discovery. The panel will take place on Day 1, October 29th, at 12:45-13:25. October 29th to 31st, 2018. ImmunoPrecise is excited to announce that we will be attending hubXchange’s US West Coast Antibody Engineering Xchange in San Diego on September 26th, 2018. HubXchange specializes in delivering high-level content, intelligence and connections to the global Life Sciences community by hosting outstanding business Xchanges. These meetings are a series of highly-interactive roundtable discussions bringing together executives and senior academics over the course of one day. This ‘sharing-learning‘ platform is a powerful tool helping to address and find solutions to real-world industry challenges. HubXchange’s US West Coast Antibody Engineering Xchange 2018 will bring together executives from the pharma and biotech sectors, as well academia. ImmunoPrecise will be presenting the keynote industry talk and facilitating two roundtable discussions focused on antibody discovery- providing insight and offering solutions on how we can face challenges in the antibody engineering industry. 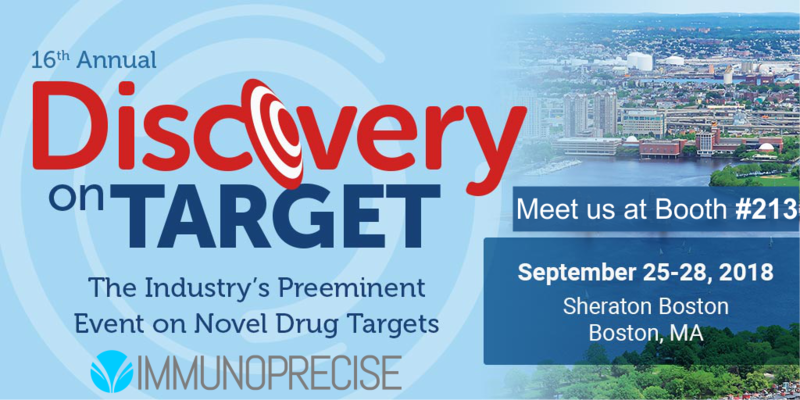 ImmunoPrecise is excited to be exhibiting at this year’s Discovery on Target conference from September 25th to 28th in Boston, MA. Visit booth #213 at the Sheraton Boston, and discover how ImmunoPrecise can further your therapeutic antibody development. With over 1,300 drug discovery professionals in attendance, representing over 20 different countries, DOT 2018 is the perfect opportunity to learn, connect, and share information in this rapidly expanding and constantly developing field. Click here to schedule a meeting with one of our delegates from ImmunoPrecise or Modiquest Research! ImmunoPrecise is a full-service, therapeutic antibody discovery company focused on the next generation of antibody discovery. We deliver the most therapeutically-relevant antibodies, in a shorter period of time, with the highest probability of succeeding to clinical trials. Set up a meeting to learn more! The 16th Annual Discovery on Target, “The Industry’s Preeminent Event on Novel Drug Targets,” will once again gather over 1,300 drug discovery professionals in Boston, MA, this September. The event brings forth current and emerging “hot” targets, technologies and validation strategies for the development of novel small molecules and biologics. ImmunoPrecise Antibodies Ltd. is a full-service, antibody discovery CRO focused on the next generation of antibody discovery. We aim to deliver the most therapeutically-relevant antibodies, in a shorter period of time, with highest probability of succeeding to clinical trials. IPA is a single source provider of services for the complete antibody discovery value chain. We offer the most comprehensive collection of antibody discovery platforms in the industry, combined with state of the art lead candidate optimization and characterization. This allows us to assist clients from the moment they identify a therapeutic target to the preparation of applying for investigation review of the clinical product. Brought to you by the same organizers of Antibody Engineering & Therapeutics US, in conjunction with The Antibody Society; AET Europe brings together the latest science, technologies, and partners needed to accelerate next generation antibodies to commercial success.